Rana Overseas leading Manufacturer, Exporter and Supplier of Wooden Brass Shehnai / Indian Musical Instrument. We have wide Range of Wooden Brass Shehnai / Indian Musical Instrument. We have various Size and various Designs and Shapes. This Shehnai Instrument gradually widens towards the lower end. It usually has between six and nine holes. It employs two sets of double reeds. making it a quadruple reed woodwind. By controlling the breath. Nadaswarams is being offered by us at highly reasonable prices. These are mainly used in South India and favored for their classic ebony wood make. This is the most popular instrument in Tamil Nadu and acknowledged as the world's loudest non-brass acoustic instrument. 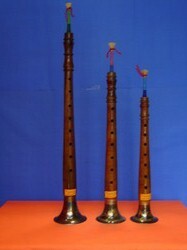 We have marked a reputed position in the market by providing a high quality range of Shehnai Musical Instrument. To furnish the ever rising demands and needs of our patrons, we have come up with a world class and extensive Musical Clarinet. Sheesham wood shehnai with brass plated cup with extran reed and fitting. 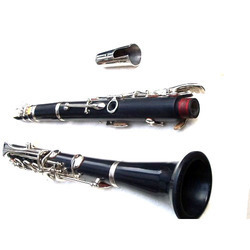 We are engaged in manufacturing different variety of Shehnai, an aerophonic instrument which belongs to the woodwind family. It comes in different sizes and looks like a long tube. Playing of the shehnai is considered auspicious because of whi9ch it is widely played in marriage ceremonies and processions. The Shehnai comes in variants with six and nine holes. Shehnai, the popular Indian musical instrument, has been redone in metal and wood and this artifact can be used to decorate your living area aesthetically. This piece of beauty not just decorates but can also be used to produce melody; use it to create music or give an ethnic touch to your decor. We offer you a wide range of designs and styles to choose from. sh - 1 : you find a whole new world of sound and performance potential on this fine instrument. You have to try it to belive it. Sundri, rosewood, size approx. L-12". sh - 2 : shehnai, size approx l - 16" no. 1.
sh - 4 : shehnai, size approx l - 14" no. 3. We are amongst the most reputed names in the industry, offering Nadaswaram.